ZORAN INVITED ME OVER FOR COFFEE to talk about Gaga. He showed me a photo of Gaga, the first I'd seen showing him during the war. The image horrified me. 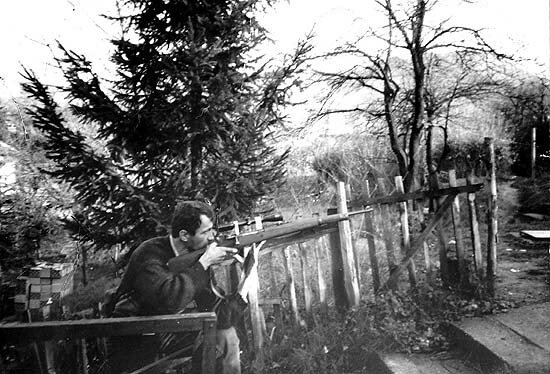 My friend stood with a high-powered rifle on his shoulder, peering though an optical scope, his finger on the trigger. It was a self-portrait, and Gaga was posing as a sniper. Zoran called the photo Gaga's souvenir of the war. Two things struck me: First, Gaga's idealized image of himself was as a sniper aiming down into Sarajevo. Second, he looked no more impressive than a ragged thug with a big gun. This man, I told myself, was no friend of mine.